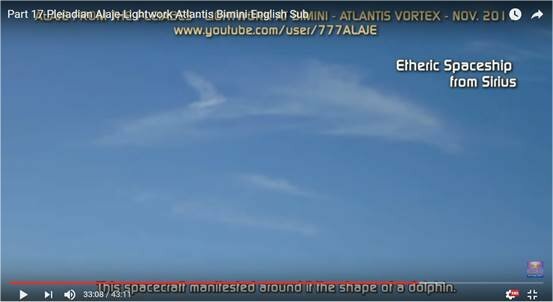 Bringing more light to a special Lightworker 777Alaje from Pleiades, there is more going on in this video if you have the eyes to “see”. 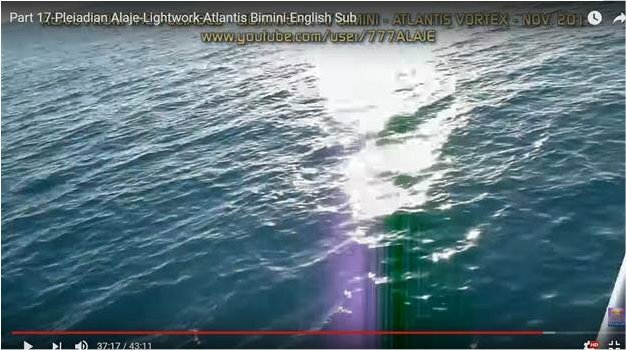 Light beams of pale pastel violet and dark and light green show up as these lightworkers are charging themselves up in the water near Bimini Island in the Bermuda Triangle before a lightworking session. 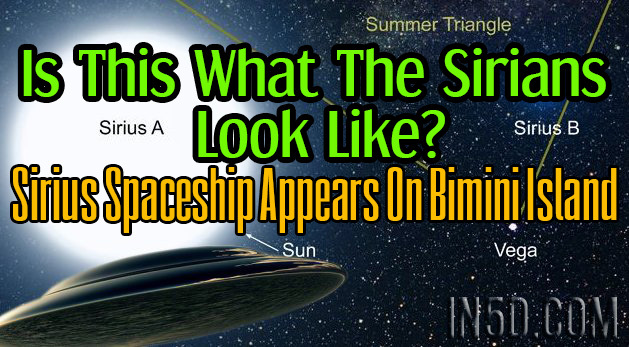 You can see in the screenshot below a Spaceship encompassed by a dolphin shaped cloud also known as Sylphs. You will also notice a male face in the water and I couldn’t help notice how much he looks like the ET in The Green Lantern. If we can imagine him with blue/purple skin, it looks like he could be revealing himself on purpose. If you add the context in which this screenshot was taken as well as the words on the screen as you watch the video, you can tell there is a synchronicity. 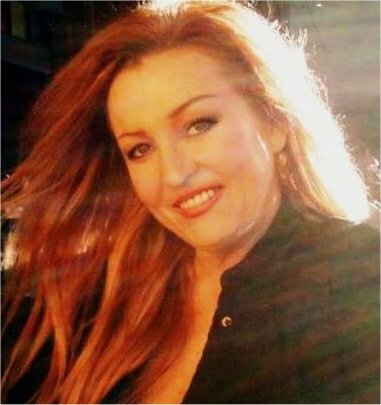 Alaje states “ Many souls who have already lived on the higher dimensions , incarnate on earth to make the energy of universal love accessible to all earth humans”. 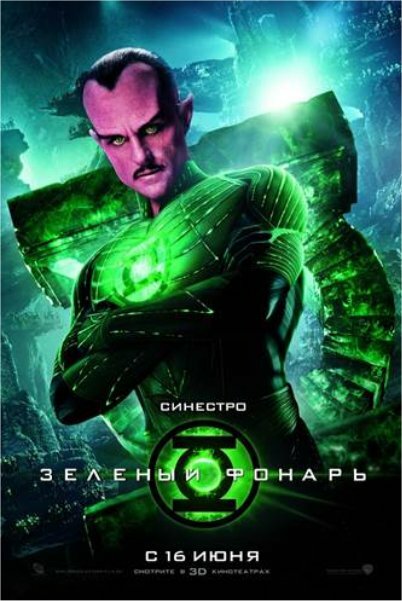 You can see the comparison of the image in the water at Bimini Island and the ET in The Green Lantern with Purple and Green in this Russian advertisement. There is so much light and so many orbs going on in this video when you pause and really zoom in, its packed with so much energy not noticeable before! He takes you on a journey to The Fountain of Youth and the other lightworkers share their experiences about what they see and feel. He also finds a Flower Of Life under the ocean. This Lightworker travels the world traveling to such places as torture chambers clearing, healing and releasing ALL trauma and you can see him do this in his playlist of video’s. 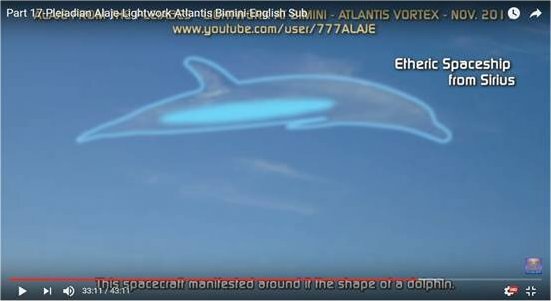 As a reward that day, he receives telepathic messages from the Sirian Spaceship making him aware that the dolphins would visit him as a sign of gratitude and seeing them arrive one hour later riding the currents with them on the boat brings great joy. He is a great example of advanced lightwork that gives us inspiration and techniques to heal negative energy and reveals many fascinating secrets about our worlds history past and present. Enjoy rediscovering this Lightworkers work and for those new to this your going to enjoy this info just as much as I did.